With all the confusion about what to eat, and with how often nutrition experts seem to change their minds, I thought it was time to go back to basic culinary medicine and see if I could find groups of recipes and actual foods for specific chronic conditions. In other words, how much has changed since I did this in ChefMD’s Big Book of Culinary Medicine almost 9 years ago? Not much, at least for longevity and well-being: Blue Zone diets (whether Okinawan, from the Nicorean Peninsula of Costa Rica, or the Icarian diet of Greece or the Loma Linda Seventh Day Adventist diets) all work to lower heart disease risk, diabetes risk, high blood pressure risk and cholesterol levels. Only one of them is Mediterranean, which is closest to what health conscious Americans have gravitated towards, what with its red wine daily suggestion and all. But there have been a number of specific food research studies that raise or lower blood sugar, blood pressure and cholesterol levels, so I’ll attempt to summarize them in the following few blogs. 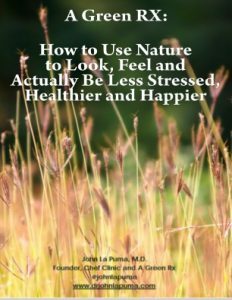 And there’s some very interesting work about how to eat, cook and spend time in nature to improve productivity, reduce chronic stress, and improve energy. Note that there isn’t just one good diet, even in the longevity centers of the Blue Zones–there are at least four: Loma Linda is low fat largely vegetarian; Okinawan is lower fat, higher fermented foods, with little meat but lots of fish; Nicorean is omnivorous; and Mediterranean is rich in vegetables, fruits, grains, beans, wine and olive oil but relatively light on meat, dairy, poultry and eggs. And not low fat, at all. Cretan men are famous for drinking a glass of olive oil at breakfast or lunch and then going back to work. Still, we’re not working like workers from Crete did, and we are developing chronic diseases fast and furiously. 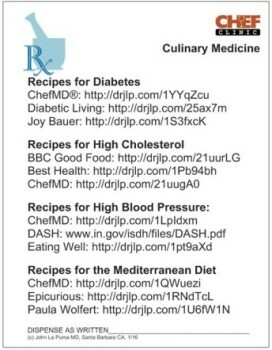 So I’ve summarized key sample recipes for several of those conditions and for the Mediterranean diet and feature them on a prescription slip here–a culinary medicine rx–and will write more about each. Why those foods and recipes work is the subject of a lot of research, and future work. Meanwhile, you can download the prescription, free, and print it out. Or click on any of its links in a clickable Rx pdf to check out the recipes.